The developer console has been made more compact and the old developer HUD has been removed. The new HUD displays the radius of hazards as well as the origin points of entities. The text output of position information is gone, as it would often be covered by the developer console. Replacing it is a tile cursor. Right clicking on a tile will display information about the mouse cursor position, the tile itself, and any entities that inhabit the tile. 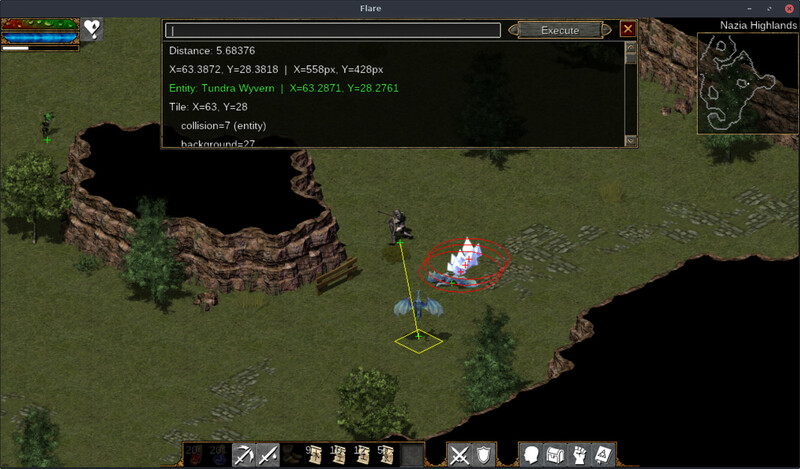 Holding right click will also calculate the distance from the player’s position. We’ve had a long standing issue with the way some tiles were being drawn in relation to other objects on the map. Tiles that are part of larger objects are split in a way that would make them improperly overlap entities. This has been fixed for the majority of cases, but at the expense of some less optimized rendering code. So if you experience performance issues after updating to 1.05, please report them. Previously, Flare tileset definitions could only contain a single image file. This made it difficult for modders to expand on existing tilesets. It also made it impossible for old graphics cards to use the hardware renderer in combination with very large tilesets. Now, modders can freely add new images to tileset definitions, eliminating those two issues. (Powers) Powers can now be prevented from being placed on the actionbar with no_actionbar. Also, multiple instances of requires_item and requires_equipped_item are now supported. (Events) Loot tables can now be used for rewards with reward_loot and reward_loot_count. (engine/misc.txt) Modders can now control if the buyback persists across maps with keep_buyback_on_map_change. (engine/default_keybindings.txt) A default set of keybindings can now be provided by mods. Tileset definitions now support multiple images. Display a message when unable to use a consumable item from the inventory. Add a hint to consumable/book tooltips to expose their interactable nature. Add ability to prevent certain powers from being placed on the actionbar. Multiple entries of “requires_item” and “requires_equipped_item” are now supported for Powers. Add “keep_buyback_on_map_change” to engine/misc.txt to disable saving the buyback between maps. Add “reward_loot” and “reward_loot_count” to Events for rewarding via loot tables. Support hidding the developer console title label. Mod-level default keybinding support added. Improved developer mode with inspection cursor. Passive powers can now continuously cast their post_power. Fixed incorrect render order for some objects; aka “character partly hidden by front of tent”. Fix stats/powers not updating when changing equipment in some cases. Prevent auto-equipping items if they would cause existing items to be unequipped. Fix revive effect not being applied when the player has zero HP. Removed unused color key attribute parsing from tileset definitions. 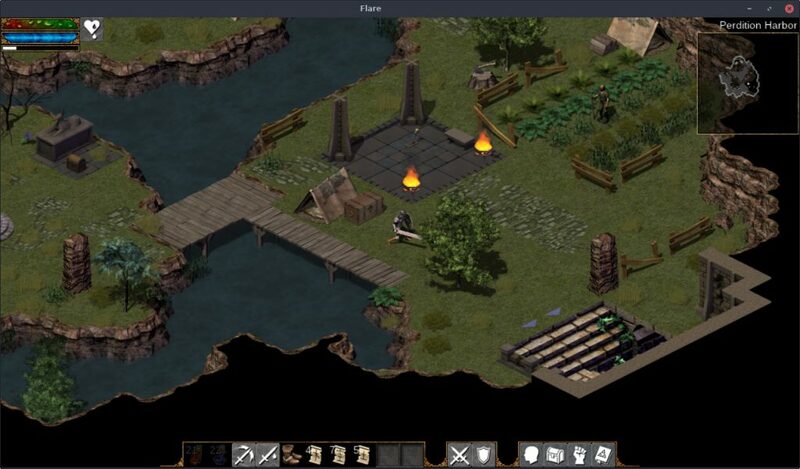 Great to see FlareRPG back again. It runs also with no problems on Raspberry Pi 3 with Raspbian if you enable the experimental GL Driver. Only for Gaming, for Video/Kodi and WebBrowsing it is better you change back to Original non-GL desktop driver. Unlike the sdl_hardware renderer, this shouldn’t require GL support. If it works, you can make Flare always use it by going to the video Configuration and selecting “sdl” in the Renderer list. Not sure how well, software rendering would perform on a Raspberry Pi, though. Just finished “Empyrean Campaign”, this hasto be the biggest and most polished open source game ever made. Mega-congratulations to the programmers, designers, art-makers, musicians, animators, beta testers, translators, coffee-makers behind this project: a masterpiece of collaboration! Great to see, that after 1.0 development is so active!